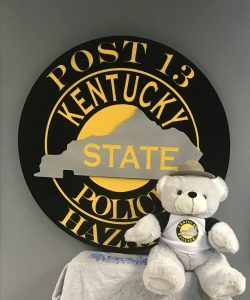 Hazard, Ky. February 11, 2019 – Just in time for Valentine’s Day, Kentucky State Police Post 13 in Hazard has Trooper Teddy Bears available for the special price of $14.99. These bears make a great gift and by purchasing one you help provide funds to keep the program going. Trooper Teddy Bears are provided to children in crisis such as a domestic situation, abuse or given to children suffering from serious illness. The Trooper Teddy Bear Project came to life in December of 1989 after Kentucky First Lady Martha Wilkinson hosted a gala fundraiser at Red Mile Racecourse earlier that summer. The event raised the needed funds to purchase 2,000 Trooper Teddy Bears. The concept of the program was for Troopers to provide stuffed animals to children during traumatic experiences such as a car crash, child or sexual abuse cases and also to distribute to terminally ill children. The funding ran out in early 2000, but was recently revived through asset forfeiture funds and donations. Zero tax dollars are used for this program which is sustained through the sale of the bears. Those interested in purchasing a Trooper Teddy can stop by KSP Post 13 at 100 Justice Drive in Hazard between the hours of 8:00 am and 4:00 pm, Monday through Friday. Sales of the bears at Post will end on Monday, February 17th. For more information about the Trooper Teddy program or how you can contribute call Post 13 at 606-435-6069.